Have you checked all these guidelines off the list yet? If you are a college student or just a person in your twenties who thinks they deserve to be called an adult, grab a pen and start checking these off your list. Once you achieve these major milestones, you will proudly hold the title of “Adult.” However, this is a difficult challenge. Not everyone can do it. 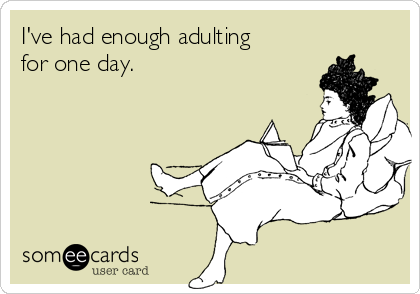 Good luck, and may the adulting be ever in your favor. 1. Learn how to make food that isn’t Ramen or HotPockets. Eggs would be a good start. Or bacon. Breakfast for dinner will always be a good choice. 2. Watch the news. This is a boring milestone, but you should know what’s going on in the world via something that isn’t Facebook. Adulting level expert requires watching the 6am segment. 3. Quit impulse buying. You do not need to go to Walmart at midnight for strawberry cheesecake. This also goes for Little Caesar’s pizza. 4. Pay for your own (GASP) Netflix account. But don’t stay up binge watching. If Netflix asks you if you are still watching, you are not adulting properly. 5. Dudes: learn how to tie a tie. No, not just the simple knot, or a clip-on. That looks like you are a fifteen year old going to your first interview. I’m talking the double-windsor knot. If you don’t know what that is, you are not an adult yet. 6. Stop watching, quoting, and posting memes revolving around SpongeBob. Some of you may want to sacrifice your adulthood for this, but there are other shows that don’t kill brain cells. I swear. 7. Sweatpants are comfy. So is your old oversized hoodie with the spicy salsa stain. But these clothing items are no longer meant for public. Or 8am class, if you are a college student wanting to grow up. 8. Keep your living area clean. This means no old fast food bags or tv dinners molding under your bed. This means your clothes should be hanging in the closet or folded in drawers. I still haven’t mastered this step in adulting, but I’m getting there. 9. This might be too obvious, but MOVE OUT OF YOUR PARENTS HOUSE. You cannot claim the title of “adult” if you are in your mid-to-late twenties and still living at home. Make a new home for yourself. Maybe even hang some photos on the walls. But just move already. 10. Toilet paper is an essential key to adulting. There will be a time when you forget to re-stock and don’t realize it until it’s too late. Adults don’t forget to buy toilet paper because they know what it’s like to suffer. 11. Get a big kid job. And when I say big kid, I mean get an adult job. Or at least work full time. Celebrating getting off your part-time shift early and going for drinks with your friends is not the adult way of saving money. 12. Someday, all your friends will be married with families and you will still be sitting in the local bar with a crowd five years younger than you. To adult properly, one must start taking relationships seriously. Unless you are Jordan Belfort. Then you can adult however you want. 13. Keep your word. As an adult, giving someone your word actually means something. You can’t just tell someone you will be there to help assemble their Ikea furniture and then not show up. If you say something, you follow through with it. Or you sacrifice your adulthood. 14. Try to wear matching socks. This isn’t really required to be an adult, but it just feels right. If your socks match, chances are you are well on your way to having your life together. 15. Keep the inner details of your life off of Facebook. If Betsy from high school, whom you have spoken two words to in your entire lifetime, knows exactly what you and your boyfriend were fighting about last night and why you hate a certain co-worker, you are posting too much information. Keep it mature, people, and you shall achieve adulthood.